A Sunshine day for Brass Castle, voted Champion of Champions at Clifford Champion Beer Festival on Saturday 25th June. Fair play to this cutting edge Malton Brewer whose Sunshine ale was OTB at the sixth annual festival in line with CCBF policy of presenting Champion brews; Sunshine was Society of Independent Brewers (SIBA) 2014 ‘Champion Bottled Beer for the North East of England’ and SIBA 2013 ‘Champion Beer for the North East of England’. 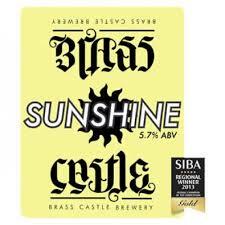 Brass Castle describe Sunshine as an India Pale Ale made in the traditional Yorkshire way, only with a pile of new world hops for fruity citrus bite. A North Yorkshire version of the west coast style with three hop types to justify the ‘sunshine in a glass claim’: ABV 5.7%, OG 1.061, IBU 97-100. I’m a real big fan of Brass Castle ales. They only started in 2011 and they seem to be going from strength to strength. I’ve enjoyed everything I’ve ever tasted from them. I’m no vegan, but I like their philosophy of using vegan and vegetarian friendly ingredients and their local eco ethos with the spent grains and hops. I had a few halves of Brass Castle Life’s a Beach at the weekend, in an excellent pub in Scarbro’ which I will be featuring soon. It’s a sort of summer ale (it’s not even on their web site yet). It’s a bit different, almost exotic, almost … wow. Pina Colada Rodney, Pina Colada! I can feel a trip down the A64 on the Coastliner coming on and a visit to their, every second Saturday 12 – 8 pm, Malton brewery tap room, eight of their ales on offer straight from the brewery. Sounds pretty cool to me. Keep up the good piece of work, I read few content on this internet site and I think that your weblog is real interesting and holds bands of excellent information.